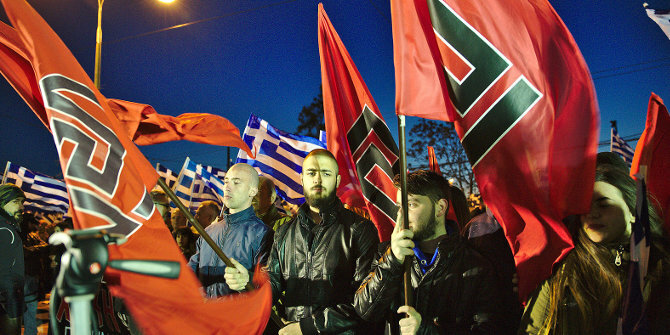 Golden Dawn made large gains in the May 2012 Greek elections and has largely maintained this position in the three Greek elections held since, making it one of the most electorally successful far-right parties in Europe. But what lies behind this success? By comparing the political situation in Greece with that of Spain and Portugal, Daphne Halikiopoulou and Sofia Vasilopoulou demonstrate how support for the far-right is not only driven by the Greek economic crisis, but also relates to the breakdown of political trust, good governance and the perceived efficacy of the state. Most theories suggest that extreme right parties cannot be electorally successful in post-war Europe. Extreme right parties – that is, parties with clear links to fascism, which employ violence and reject democracy – cannot fare well electorally because of the association of fascist ideals with totalitarianism, mass violence and racial extermination. Instead, the far-right parties that have experienced electoral support in post-war Europe tend to be those that have disassociated themselves from fascism, endorsed procedural democracy and adopted a narrative that stresses ideological rather than biological rationalisations of national belonging. The Greek Golden Dawn is an extreme right party. The party falls under the neo-Nazi label because it fulfils what Mann identifies as defining criteria of a fascist group, including nationalism, statism, paramilitarism, transcendence and cleansing. The party endorses the principles of National Socialism: it opposes democracy; it rejects liberalism and socialism; it employs violence; it is a hierarchical organisation that concentrates all power in the hands of the leader; its ultimate goal is to establish a state that functions fully and solely in accordance to the principle of nationalism; it believes in racial supremacy and emphasises the superiority of Greek descent over all other groups; and it sees itself as having the unique mission to lead the nation into a phoenix-like national rebirth, rising from the ashes of the old degenerate social order. Defying all theories, and going against the broad European trend, the Golden Dawn marked an electoral breakthrough in Greece during the May 2012 elections, when it received 6.97 percent of the votes cast, gaining 21 seats in a parliament of 300. Since then it has been able to sustain its support at approximately 7 percent of the vote, despite the fact that in recent years its leading cadres have been imprisoned and put on trial for maintaining a criminal organisation. Why has this party been able to attract such support, despite its extreme character? A popular explanation for the rise of the Golden Dawn is economic crisis. A large body of literature links economic malaise to extreme right party support, postulating that such parties are often able to capitalise on the insecurities of downward social mobility. In other words, the unemployed, the dispossessed, the losers of an economic crisis are likely extreme right party supporters. For example, the inter-war economic crisis is often linked to the rise of fascism in Europe. A way to test this proposition is to assess it comparatively: if the increase in Golden Dawn support is linked to economic crisis, then we should expect to see countries facing similar crisis conditions experience support for similar parties. Spain and Portugal offer an ideal platform for such a comparison. These countries share a number of political, cultural and economic similarities with Greece. All three countries have a strong left-right cleavage; they have experienced civil war and right-wing authoritarianism; and they became democracies during the third wave of democratisation. In addition, they are all European countries of the periphery with similar levels of socio-economic development, which formed the main beneficiaries of the EU’s structural and cohesion funds prior to the Eastern enlargement. They have been affected by the Eurozone crisis more than any other Eurozone member and have experienced its severity through rising unemployment and consecutive terms of negative growth. All three countries have active extreme right parties. The Spanish National Democracy (DN) and the Portuguese National Renovator Party (PNR) are both comparable to the Golden Dawn in terms of their ideology, organisation and rejection of parliamentary democracy. They also have similar nationalist agendas, advocating the maintenance of the homogeneity of the nation and a return to traditional values. Yet these parties have not experienced a similar increase in their electoral support. This begs the question: if economic crisis is the prime cause of the rise of the Golden Dawn, why have extreme right parties in countries that have experienced comparable crisis conditions such as Spain and Portugal remained marginalised? Why is Greece the only crisis-ridden country with a successful extreme right party? In a recent study we argue that the answer lies in the nature rather than the intensity of the crisis. Our comparison indicates that one of the major differences between the three countries is the extent to which the crisis triggered the breakdown of the political system itself because of the perceived limited ability of the state to address the crisis. We understand this as a perceived breach of the social contract, which occurs when severe issues of governability impact upon the ability of the state to fulfil its obligations to citizens. This breach of the social contract is accompanied by declining levels of trust in state institutions, resulting in party system collapse. In other words, extreme right parties are more likely to experience an increase in their support when economic crisis spills over into an overall crisis of democratic representation. We measure this through the use of a number of indicators that measure trust, good governance and the perceived efficacy of the state. While there is a general trend in Europe of low levels of trust in institutions and low satisfaction with democracy, on average Greece scores much lower than Portugal and Spain (as shown in the figure below). 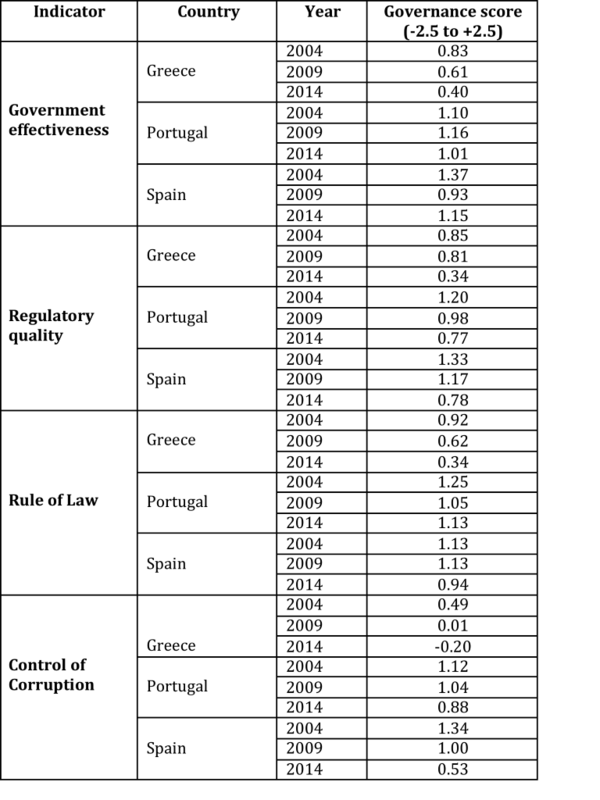 In addition, in terms of these state performance and perceptions of quality of state services, Greece ranks poorly compared with the other two cases and showed a notable decline in its governance score (as shown in the table below). A focus on Greece as an outlier or single case study would point to the causal relationship between economic crisis and extreme right party support. This, however, would constitute a fallacy as such an approach lacks the potential to control for alternative explanations. Our explanation of why Greece and not the other crisis-ridden countries experienced the rise of an extreme right party derives from a comparative logic: why do similar countries facing similar conditions experience different levels of extreme right party support? 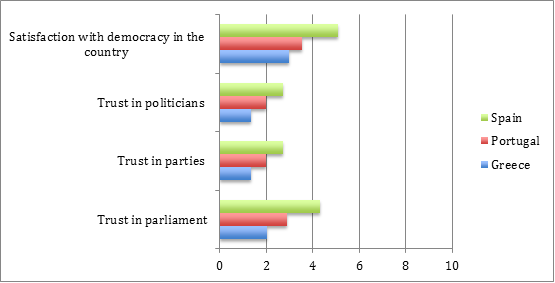 Our answer centres on the nature of the crisis: economic crisis versus an overall crisis of democratic representation. What facilitated the emergence of the anti-systemic Golden Dawn in Greece was not the economic crisis per se, but rather the political dimension of this crisis, namely the perceived inability of the state to mediate it, resulting in a crisis of democratic representation. Under circumstances of severe issues of governability, citizens are likely to question the existing mechanisms of democratic representation. This opens space for anti-systemic parties that offer an alternative vision of representation. The conclusions from our argument are generalisable: if we are right, countries that experience both economic crisis and extreme right party support are more likely to also exhibit low or declining levels of trust in state institutions, declining perceptions of state capacity and severe problems of governability. Note: For more information, see the authors’ recent study in Government and Opposition. A version of this article originally appeared at our sister site, Democratic Audit. This article gives the views of the authors, not the position of EUROPP – European Politics and Policy or the London School of Economics. Daphne Halikiopoulou is an Associate Professor in Comparative Politics at Reading University. Sofia Vasilopoulou is a Senior Lecturer in Politics at the University of York. Those descriptions could just as easily be describing the far left, so why is it only the so called far right which attract these sorts of articles?